G Stuff Stuffs Us Good on its 3rd Year Anniversary! 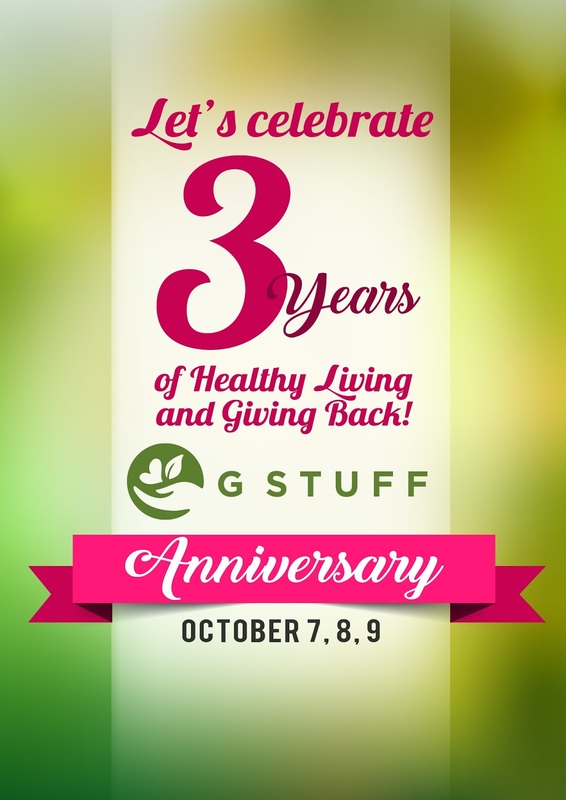 G Stuff will celebrate its 3rd Year Anniversary on October 7, 8, and 9! These is going to be an eventful three days of helping us live healthy lives and three wonderful years of caring for the environment and helping communities of people in the provinces to improve their lives! Dubbed the “healthy store with a heart,” GStuff has now marked its name as one of the brands that advocate health and wellness, natural lifestyle and sensitivity to the environment. Every bottle has a story. On October 7, some celebrities and possibly a community of farmers, fishermen and craftsmen who are behind the production of some of the best-selling G Stuff products will be featured in Umagang Kay Ganda. G Stuff’s new product lines such as herbal soaps, plant-based insect repellents, authentic Gugo shampoo, natural diffusers using traditional Ilocano red clay pots, detergent made of natural granules will be introduced. These products are already gaining popularity in the different branches of G Stuff store in Power Plant Mall, Alabang Town Center and Trinoma. On October 8, the newest G Stuff Christmas bundles will be presented in Magandang Buhay TV show hosted by Karla Estrada, Melai Cantiveros, and Jolina Magdangal. Promoting the slogan “Have a healthy Merry Christmas,” these bundles can be given as exciting gifts for loved-ones and friends. Their receivers assured of their health amidst bottles or liquors, bevy of sweets and pork & ham that fill the dining tables when the Holidays come. A whole day of health and wellness in Rockwell is set to unfold on October 9. Renowned fitness instructors will facilitate Zumba sessions. GStuff’s booths will also display their staple Virgin Coconut Oil-based products and along with the new natural products they are carrying. Other exciting wellness activities will also be offered to the participants of this event when they register! Upholding its tagline of healthy living, caring for the environment and helping people, G Stuff commits to continue in pioneering a wholesome lifestyle in the realm of the retail industry. For more information, contact Anna Dolendo at 09154650759 or Wilbur at 09154343337 or the Warehouse Store at 4161828. We are @gstuff on Facebook! Like us and let’s all live healthy while helping!